Sometimes I'm in a salad rut. When lunch time comes around, I'm not always feeling the greens. So what helps? Well, I think variety will be your best friend in this case. It is for me. 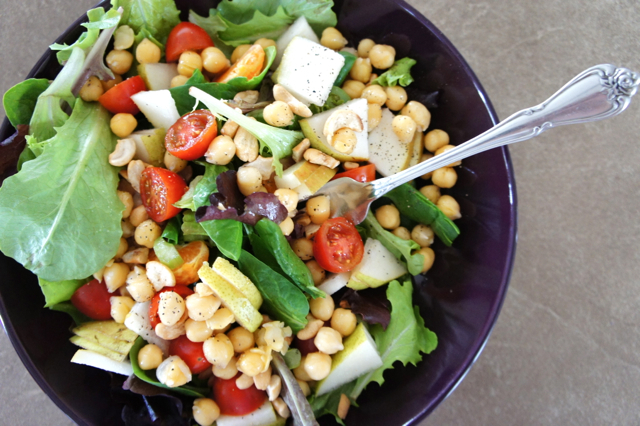 Different colors, flavors, and textures will keep your salad interests peaked. 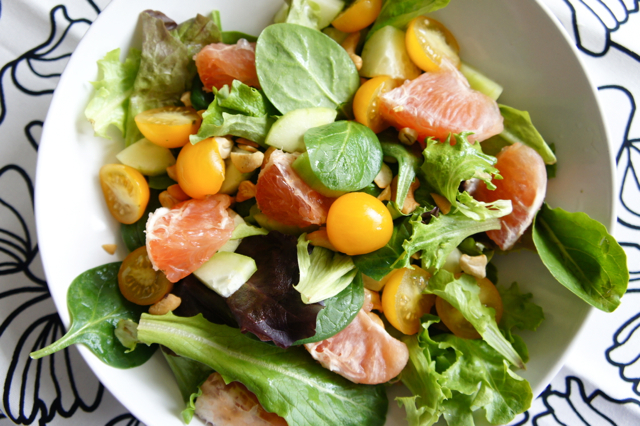 Day 1: Grapefruit Tomato Salad - Mix of greens and spinach, cucumber, yellow cherry tomatoes (any color will do), cashews, grapefruit, and I added avocado after this shot. With grapefruit being in season, I thought this would be a fun try. Yes, the grapefruits are tart, so you'll need to balance that with the salty cashews and the avocado. Very fun to eat and makes you feel good after. 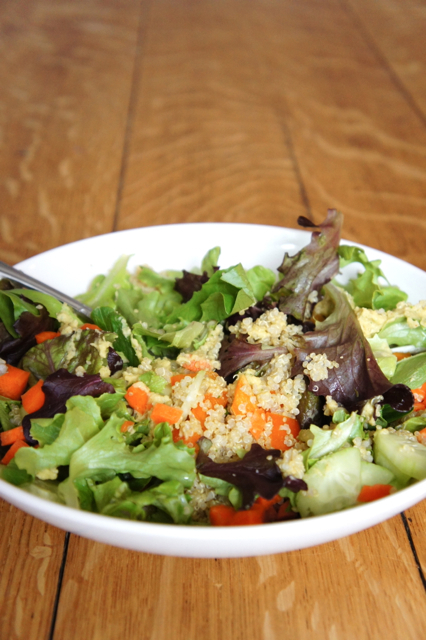 Day 2: Quinoa Hummus Salad - Mix of greens, carrots, cucumbers, hummus, and quinoa. The quinoa was left-over from the night before. I think it tastes best if cooked in broth rather than water, but do what you prefer. The hummus I also made. If you have a food processor, it's probably the easiest thing you'll make. 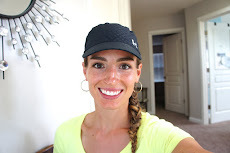 You could heat up the quinoa if you're looking for a warm addition; I ate mine cold and enjoyed it. 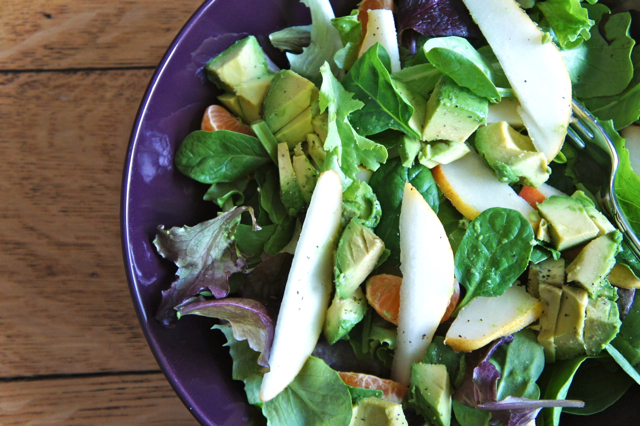 Day 3: Pear Avocado Salad - Mix of greens and spinach, pear, avocado, and orange slices. I'm now in love with pears on a salad. They are kind of a background flavor and their fleshy fruit is a fun pairing with the lettuce. The avocados creaminess goes well with the pears, but offsets the sweet well. 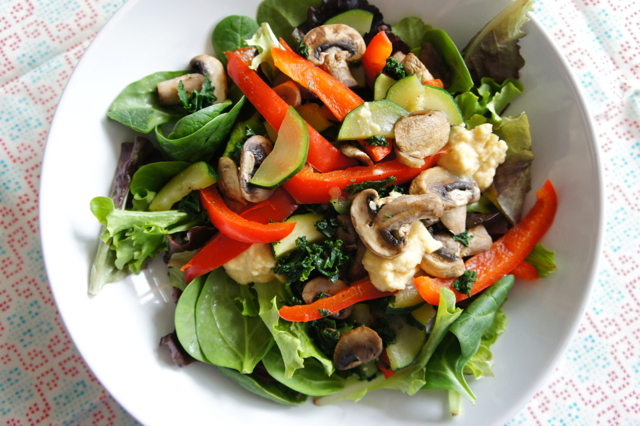 Day 4: Sauteed Veggies with Hummus Salad - Mix of greens, spinach, hummus, red bell pepper, zucchini, mushrooms, and kale. If you're in the mood for a warm lunch, this is perfect. I love the combo of sauteed veggies and hummus. I water sauteed the 1/2 a bell pepper, 1/2 a zucchini, a handful of sliced mushrooms, and another handful of chopped kale. Season with salt and pepper and serve with hummus on your greens. Filling and warm is served. 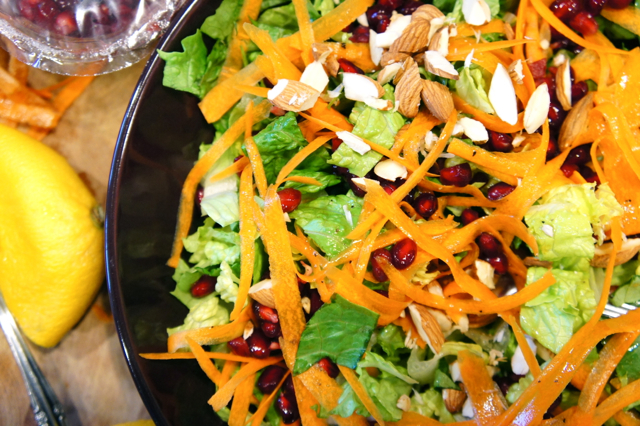 Day 5: Pomegranate Carrot Salad - This was a mix of romaine, carrot in peels, pomegranate seeds, and sliced almonds. I added fresh squeezed lemon juice, salt, and pepper on top. I love the look of pomegranate seeds in a salad, they have such good color. But even better, they are a good pop when you eat them! 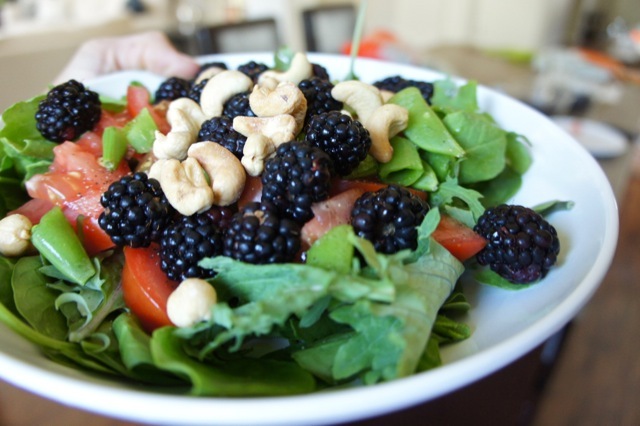 Day 6: Blackberry Cashew Salad - Mix of greens and spinach, snap peas, tomato, garbanzo beans, blackberries, and cashews. I love the color of the berries in this one. 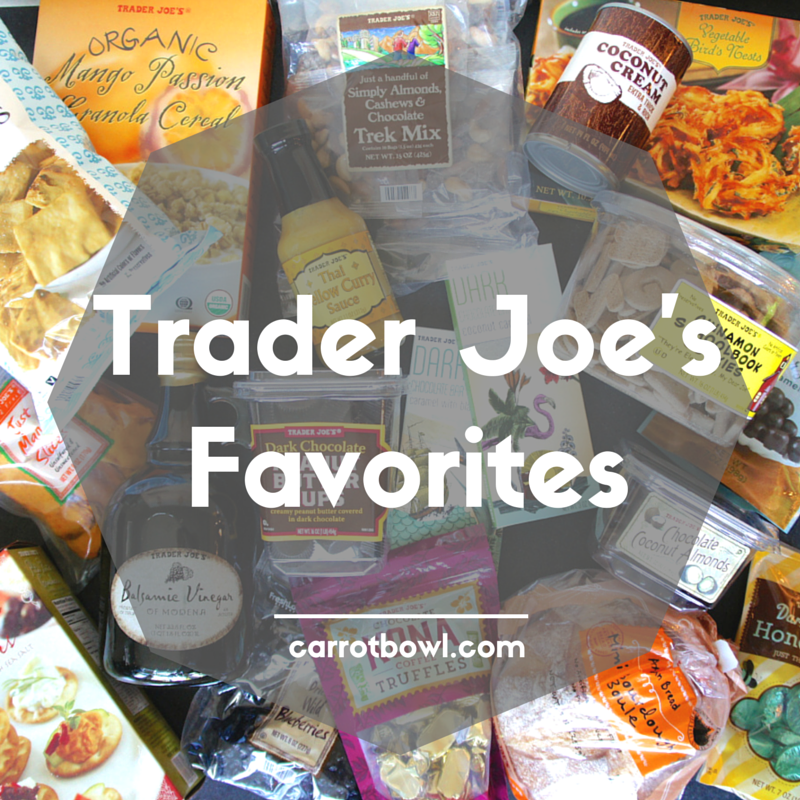 I also really like the pairing with salted cashews. Day 7: Garbanzo Bean Cutie Salad - This was a mix of greens, spinach, pears, grape tomatoes, garbanzo beans, celery, cashews, little orange slices (think Cuties), and avocado. I typically don't think of putting oranges on a salad, but especially with the little ones, it's the perfect sweetness. 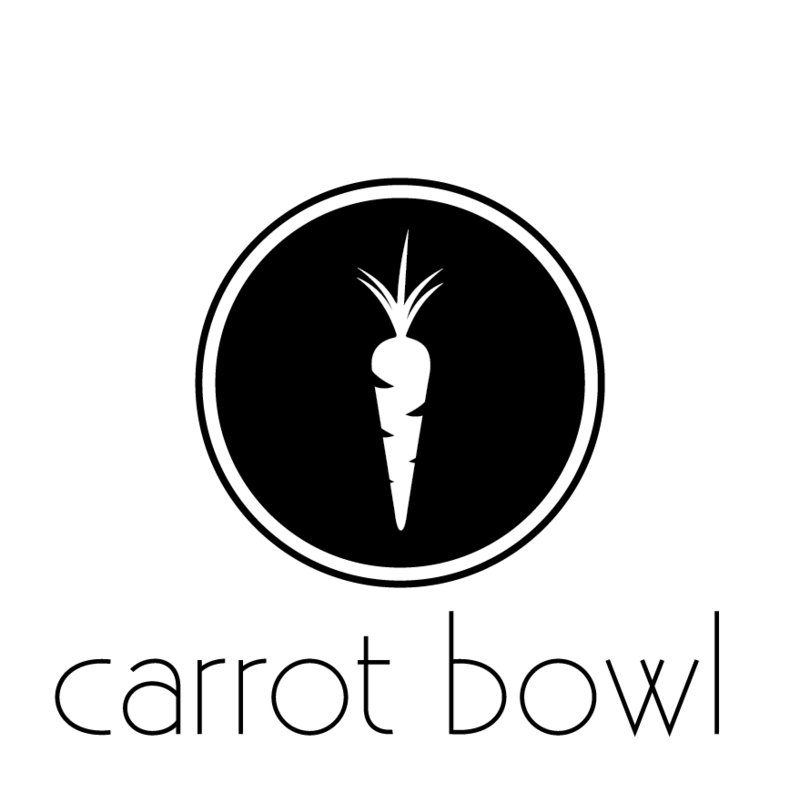 It's a surprising bite for a salad, one that you and guests will enjoy.